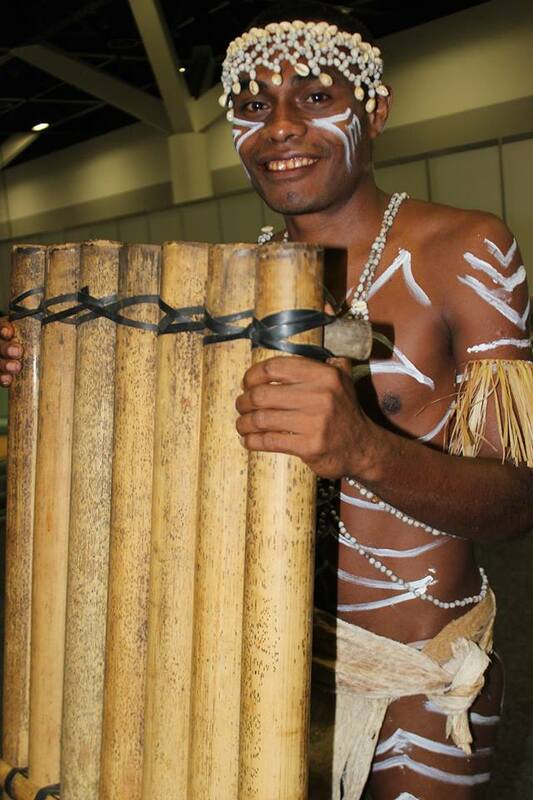 The sounds of Solomon Islands Pan Pipers filled the exhibition room at the International Convention Centre, Darling Harbour and SIVB Marketing Manager, Freda Unusi proudly announced that the Solomon Islands had just been voted as the country with the cleanest air in the world by the World Health Organisation. “Welcome to my home, voted yesterday by the WHO as having the cleanest air in the world,” Ms Unusi announced. “Come and dive with us, dive our grand central station and be mesmerized by 247 species of fish, come and snorkel our reefs, we have 497 species of coral, kayak in the worlds biggest lagoon, birds we have 100 species endemic to the Solomon Islands, our authentic artifacts are made of wood and shells and are real and classy, culture is what we are, we eat, we drink and we sing” Ms Unusi said as her voice echoed against a pictorial backdrop from the islands. The Pan Pipers and dancers treated the delegates to a number of performances during the morning tea break at SPTE 2017 which was sponsored by the SIVB. A total of 109 sellers from 17 member countries of SPTO are present at the event to brief 79 buyers from as far away as Europe, United States of America, Canada, China, South Korea and Australia and New Zealand on the tourism products of the South Pacific. Delegates to the two-day event have been immersed in a range of Pacific experiences including dances and presentations by the Heilala Dance group from Brisbane who perform a fusion of Pacific dances, that highlight the uniqueness of the Pacific way. Held annually SPTE provides an opportunity for Pacific tourism and travel operators to showcase their products to international buyers who are the face of the Pacific to travelers curious about the Pacific as a destination. Support for the event has come from major sponsor Bank South Pacific who has partnered with SPTO since 2016. Other Pacific partners supporting the event are the Solomon Islands Visitors Bureau, Nauru Airlines, Papua New Guinea Tourism and Promotions Authority (PNGTPA) and Fiji Airways.